simply for curfew violations, with hundreds sent for up to two years to military camps in Montana, Oklahoma, Tennessee, and Texas. In Fort Missoula, Montana, these American citizens joined 1,000 Italian nationals who had been interned there since May, 1941. [American-Italian Historical Association, and the book Una Storia Segreta: The Secret History of Italian American Evacuation and Internment during World War II]. Given that most of these people lived in east coast cities, and many of them had family members fighting in the American Armed Forces, the shock and sense of betrayal of dislocation was significant and lasting. 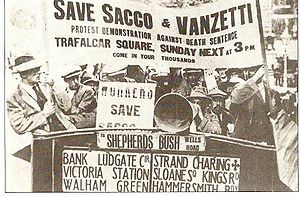 But the precedent for unfair treatment of Italian immigrants had actually been set decades earlier, with the famous—or should I say infamous—trial of Ferdinando Nicola Sacco and Bartolomeo Vanzetti, anarchists accused of armed robbery and executed in 1927. It’s too long a story for this blog, but the short take is the public was afraid of these foreigners, and partly for good reason. Two days after they were indicted, an anarchist sympathizer—also Italian— allegedly orchestrated the Wall Street Bombing, where a time-delay dynamite bomb packed with heavy iron sash-weights in a horse-drawn cart exploded, killing 38 people and wounding 134. [Wikipedia, relying on Paul Avrich’s book Sacco and Vanzetti: The Anarchist Background] Sounds eerily familiar, doesn’t it? Today we love our Italian brands. Ferrari and Fiat. Ferragamo and Fendi. But in the new normal, when we are under a constant state of threat, a foreign name or heritage that is as unfamiliar today as “Italian” was in the last century, can be a negative brand that is hard to overcome, even in a country founded by immigrants. Playing Mahler: My Response to Boston Terror Are Some Kids Branded Academic Losers?